I was very surprised to see the survey published Juxt Consultant on Non Resident Indians. The survey gave details on the earnings of Indians based abroad (Non Resident Indians). The people covered were mostly residents in UK, US and Middle East. I have earlier covered some interesting facts about Indians living abroad. 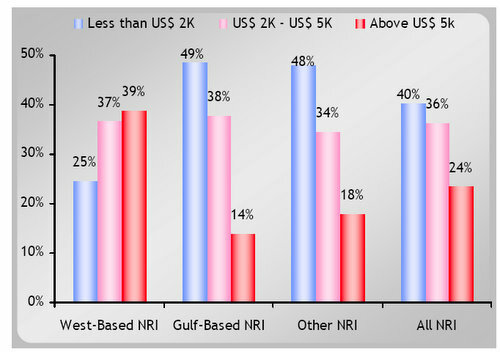 Surprisingly, the average income levels of NRI’s is quite low in US. The situation is even worse in Gulf based NRIS. The survey shows that more than 62% Indians based in US/ UK earn less than $ 5000 a month (including taxes). If you calculate an average US tax rate of 30%, the net income of these NRIs comes to less than $3500, which in my experience will not leave any scope for savings. This is especially true if you have more than 2 family members. In most cities, the rental is anywhere between $800 to $1200. In palces like California, it may go higher and in places like North Carolina it may be lower. The utilities include Electricity, gas, heat, water etc. Dining out may be higher or lower. I am not able to really say how much this costs normally. But even if you eat one or twice a week in a restaurant, you easily end up spending around $200. Car is a must in US. Even if you buy a old car, the maintainence and car loan premium may cost you around $400. Entetainment includes Cable, Internet at home etc. Miscelleneous may be much more than $200- A lot of stuff costs you like parking, Phone cards, buying clothes etc.I have not included medical expenses in the table, but it may cost you a lot even if it is a co-pay. By this chart, total expenses comes to around $3000- So, the savings stand at meagre $500 for more than 62% Indians living in US. Is it worth it ??? I cannot even think of people in Gulf, majority of whom earn less than $2000 per month. If any of my readers live in Gulf they could provide me with first hand information on what kind of cost of living one incurs there. Thanks for showing the actual picture of NRI because it is set in the mind of every indian that all NRI’s are wealthier and rich. I am also convinced with your thoughts that what looks straight always not be true. The comments are very apt in changing times. However, we will have to agree that quality of life is still better in West and even in Gulf. This comparison is after experience in many Indian cities and Dubai. No doubt, the difference is thinning gradually, however, the civic facilitites and the fact that being away from homeland itself gives motivation to grow. I Vishnu Dev from Doha, QATAR. The Situation at Gulf is more or less the same. The hike in housing properties have spiralling effect on the price of other commodities. Just two years back, an Two bedroom aparment was costing around 4000-5000 QR (Qatar Riyal). Now, you will not get it for 9000 QR. The currencies are pegged to Dollar (Only Exception is Kuwait). The inflation is very high mainly due to the hike in rent. Those who are working in Government sector or government owned companies are well taken care by the respective institution. The people in the private sector are in the receiving end. Majority of them sent their family back home. The Dollar peg has corrosive effect on their monthly savings in INR also. The foul play of the intermediaries in the housing sector are to be blamed. Your projection about the Gulf Region is quiet reasonable and meaningful also. Nothing is exaggerated. Interesting article… being from Texas I thought I’d try to provide you with a little additional information. While none of the calculations are really off, there are a few details which are incorrect or missing from the discussion. – You don’t want to be in the bottom group (under $2k) anywhere, but then you would probably still be better off poor in the US than almost anywhere else. – There is no real difference between the regions represented except that lower wage workers probably migrate to the gulf states because of the cheaper cost of living. It doesn’t mean you live better on the West coast. In fact, you probably live worse because its more expensive there. – You have to stop thinking of renting a property when living in the US. For $800-$1,000 per month you can OWN your home. This means that you will be building equity in your home with every monthly payment in addition to the appreciation of the property itself. In fact, a home is the largest investment many people have and after a period of 20-30 years it can appreciate by $hundreds of thousands. – Taxes will not be anywhere near 30% at this income level. It will probably be closer to 20% if you have children, or 15% if you purchase a home because you get to write off all of the interest paid. – Don’t move to New York, California or Washington D.C. Those are the most costly places to live in the US. Instead, pick a city with a high growth index that has a relatively high income level. For example, Dallas, TX is a large area where people earn 95% as much as D.C., but where housing costs literally half as much. Obviously you can live much better here, and you can still visit the other cities on vacation! Other cities like this are Denver, Houston, Phoenix, Pittsburgh, etc. – One concept which is a little more difficult to comprehend without experiencing it is, even at the same relative level of income you generally “live better” in the US than anywhere else. What I mean is when you compare things like water quality, infrastructure, roads, construction quality, food quality, health care, employment opportunity, freedom, strength, religious tolerance, diversity, quality / availability of goods and services, etc. – the aggregate combined measure of all of these items is off the chart. – Many, many people do not move to the US because of what it will do for them “now”. Instead they do it to provide their children with opportunities they never had as a kid. My father was a Greek immigrant and he suffered for quite a while before carving out a nice living for himself. But I became the youngest Vice President ever in a major multi-national corporation and my younger brother has 900 employees in his organization at age 30. This kind of opportunity is hard to come by elsewhere, but available for ANYONE in the US. Male or female, of any race, and of any religion. Well, I hope this additional information helps a bit. I’m not trying to claim that the US is perfect, and I have traveled extensively outside the US and have an appreciation for ALL cultures. But when it comes right down to it lets not forget that the US today is basically the richest, most powerful nation on the planet (perhaps ever) and there are a lot of benefits that come along with that position that cannot be imagined, but must be experienced. A very insightful comment. I appreciate the time you have put in to present your point of view. My readers will surely benefit from it. In most part I agree to what you have said here. Buying a home instead of renting is an excellent advice. However, I have come across lot of articles that give you advice against it. Personally, I agree with your view of buying and helping build your equity. US surely is one of the best places to live on Earth, there is not doubting that in any way. If you consider opportunities too, US is miles ahead of rest of the globe. However, a lot of Asian countries are catching up. Currently, they are far behind, but 25 years from now, it may be a different picture. In terms of Kids growing here- things may really vary. Success that you have your brother have achieved is very rare. Infact, I see most of the kids of immigrants living in US do not appreciate what their parents have gone through. More often than not they end up being ordinary people, even though opportunities are abound. Thanks once again for your insights !